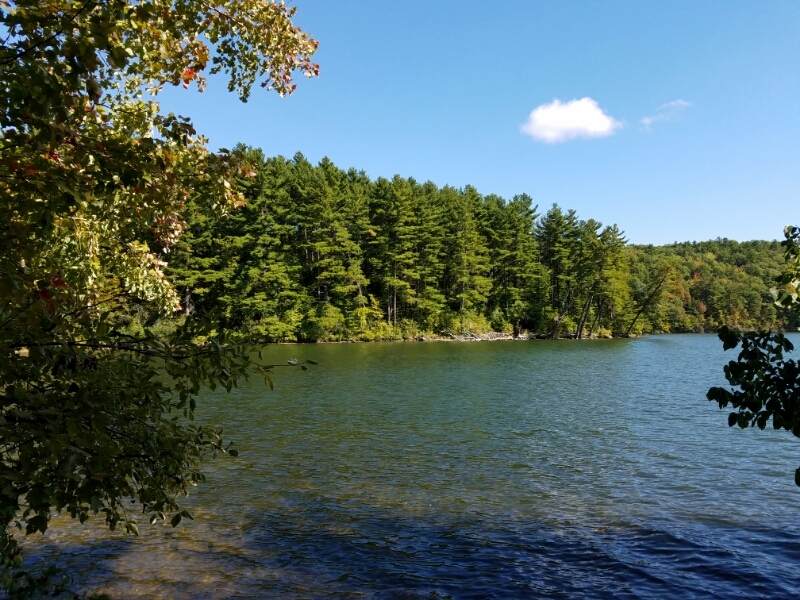 As we wrap up our last week in Burlington, we packed in a variety of Very Vermont activities including a Lake Tour in search of Champ, a visit to the Rock of Ages granite quarry, and hike the Colchester Pond loop. Our first adventure was on the Spirt of Ethan Allan III which we boarded at the Burlington dock. 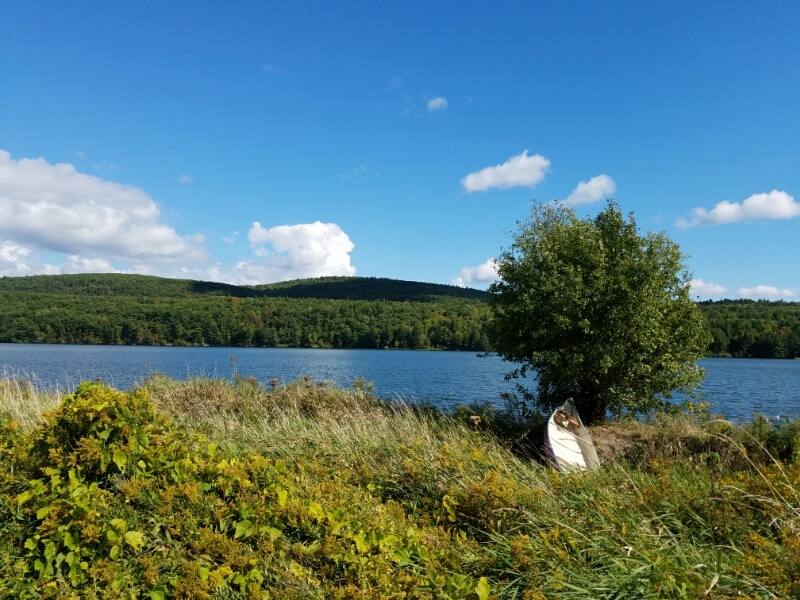 The weather was perfect – sunny and still with the temperatures in the low 70s. Ideal for hunting lake monsters! 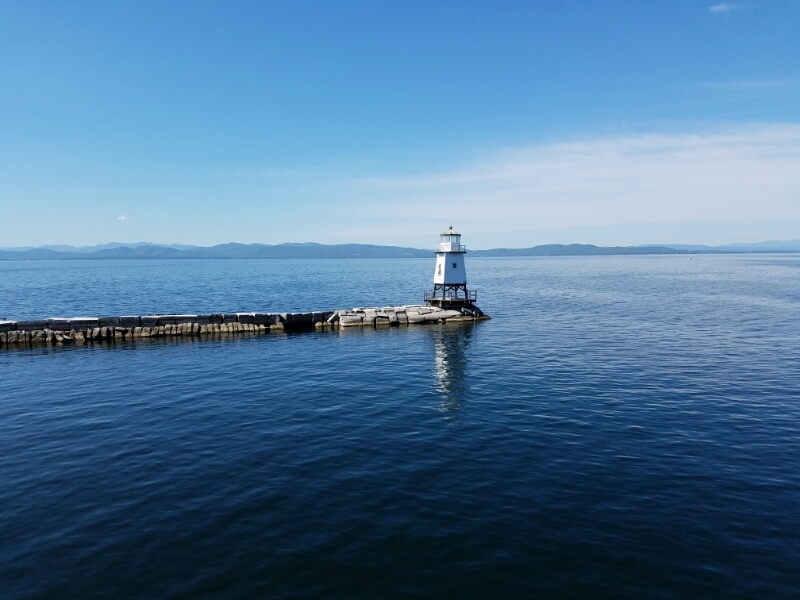 Reports of a monster residing in the depths of 125-mile-long Lake Champlain have been around since the lake was discovered. Samuel de Champlain himself is reported to have described a massive sea creature in 1609 although later research casts some doubt on whether the statement actually came from him. Regardless, many people – over 300 in fact – describe sighting a creature with a long neck and a humped back. Reports of the creature, affectionately known as “Champ” or “Champy” have been recorded over the last few centuries. 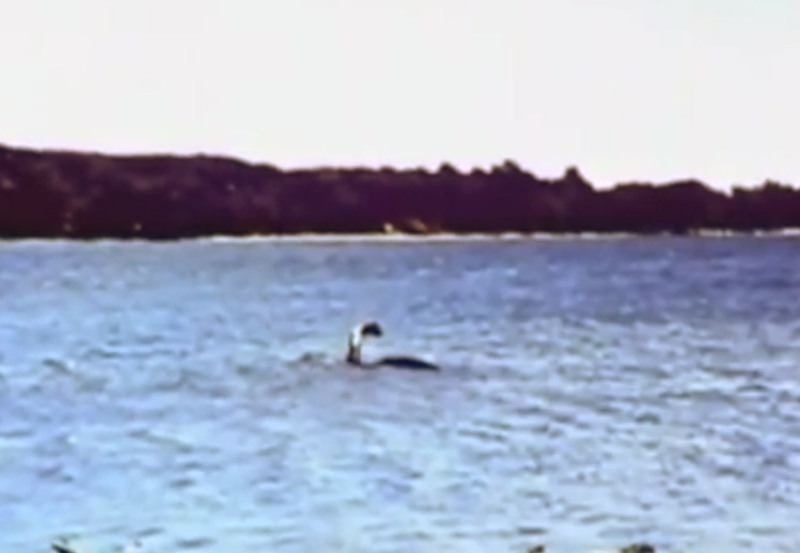 In 1977, Sandra Mansi was visiting with her family and took this famous photo of something in the lake which people claim to be Champ out for some sun. Champ? Or just the light from Venus reflecting off methane gas pockets? The most recent sighting – seen by over 70 people – was from the deck of this very ship – Spirit of Ethan Allen III” about 10 years ago. The boat company does not promise a sighting of Champ, but we kept an eagle eye out nonetheless. 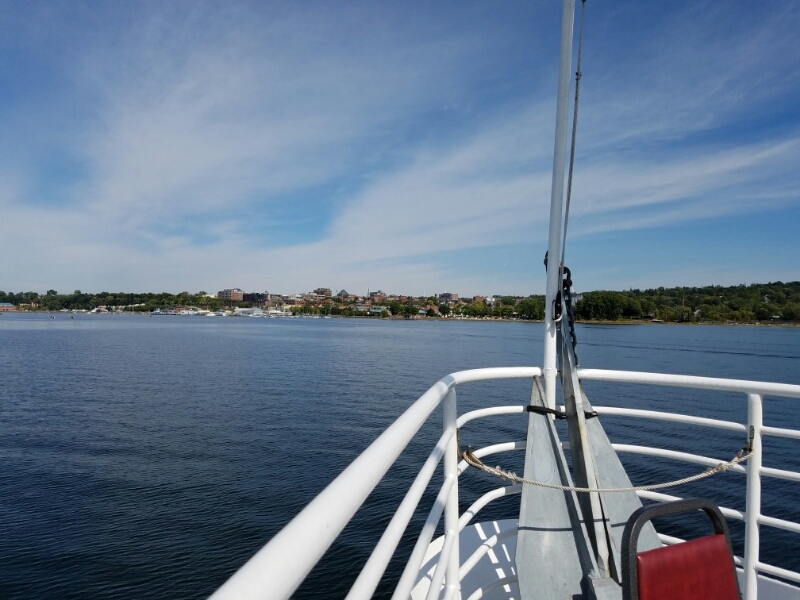 We steamed out of the Burlington breakwater and past the small lighthouse marking its northern endpoint. 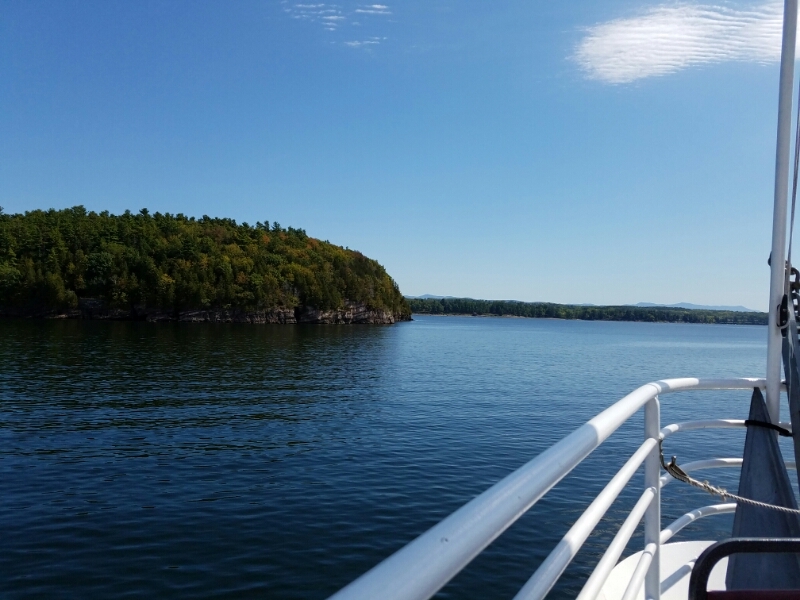 As we entered the lake, we saw several islands and the Adirondack mountains of New York state across the water. Several islands dot the lake near Burlington area, including Schuyler Island near the New York shore. 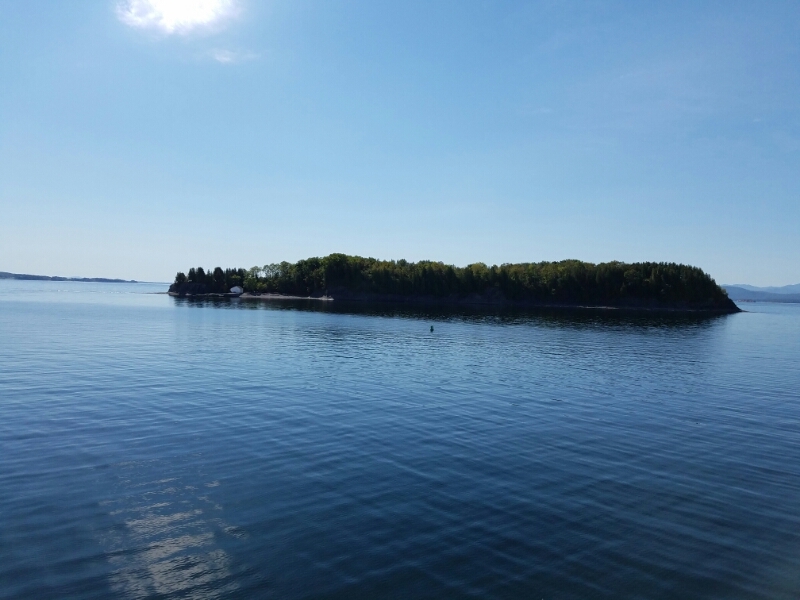 This island played a role in the Revolutionary War where Benedict Arnold regrouped his flotilla of ships. Several were sunk in this area and remain on the lake bottom to this day. The island has passed through various owners and today is part of the Adirondack park and is a designated primitive area. It is open to camping, but we couldn’t find a ferry big enough to get the MoHo over there. 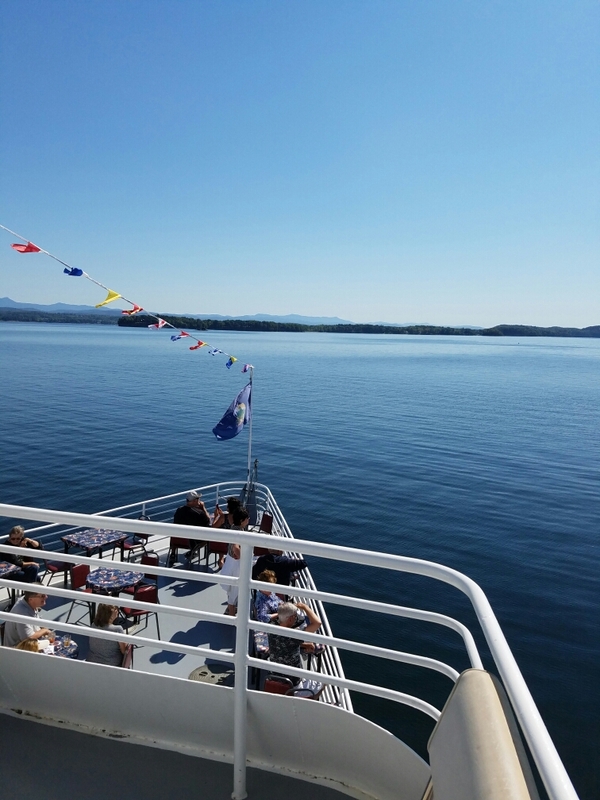 The weather was so sunny and so calm that most of the passengers were outside enjoying the sun. 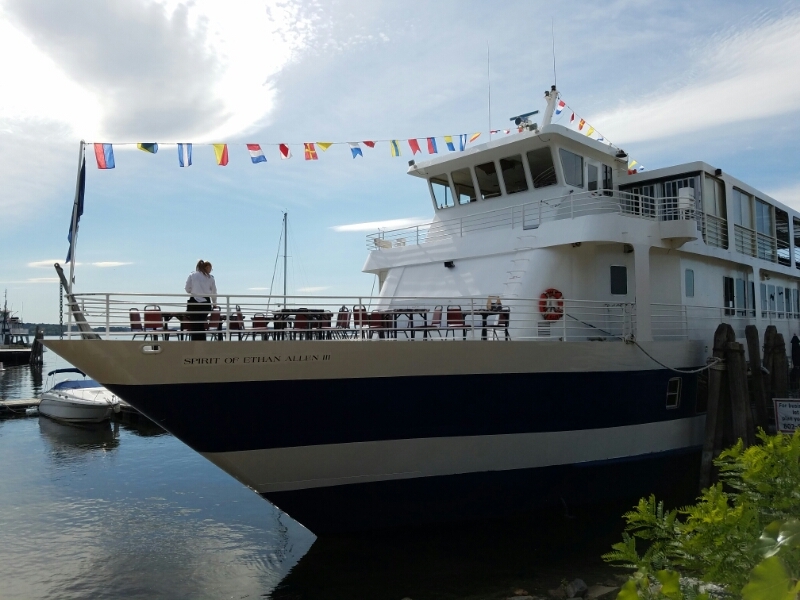 Quite a few were also enjoying a Burlington microbrew which the Spirit of Ethan Allen III serves during the cruise. It is hard to do the scenery and the weather justice. The lake was flat calm, the casual speed of the boat and the slight wind meant just a gentle breeze fluttered over the deck. The sun was out and warm. The sky was an incredible cerulean blue. We came close to the shore a few times and saw the sugar maples and pine trees up close. I hoped Champ would be hanging out here, but we didn’t see him. 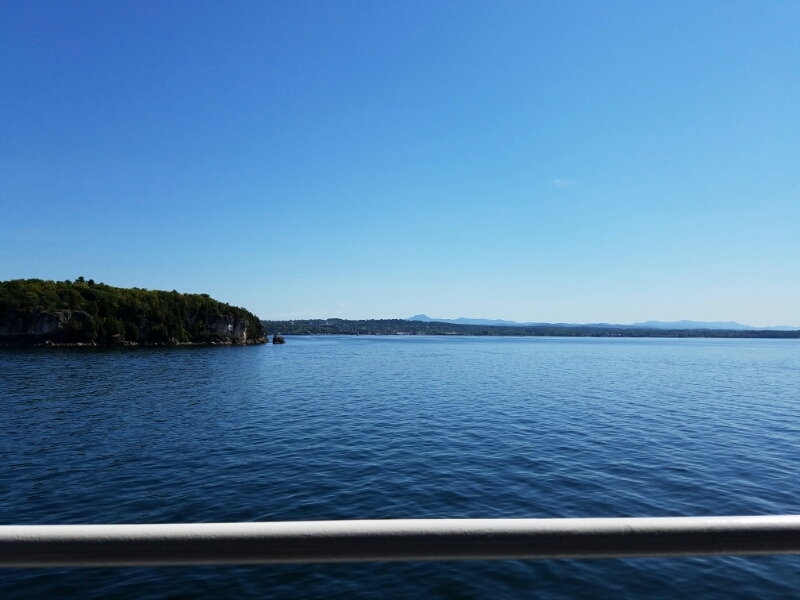 The cruise was just a couple of hours, and as we made our way back to Burlington we had a great view of town from the water. 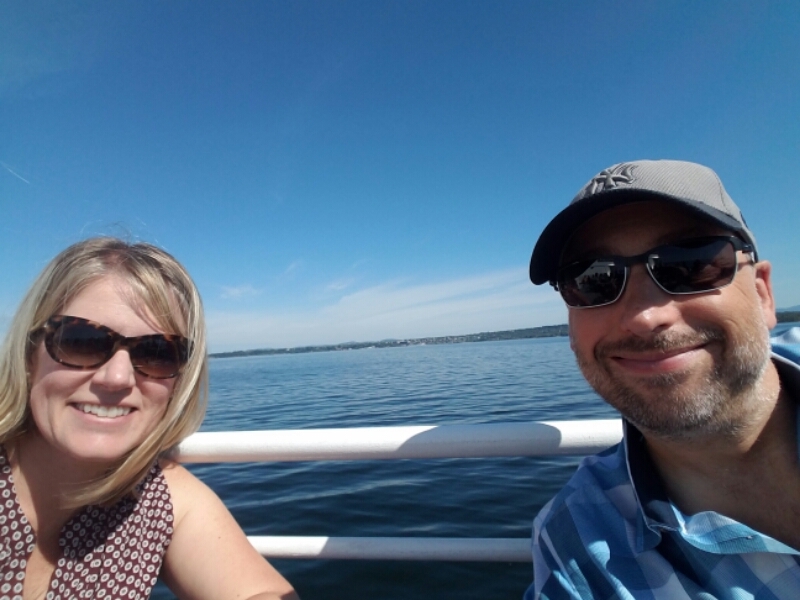 I highly recommend setting aside a couple of hours to take the lake tour on Spirit of Ethan Allen III if you have the chance. 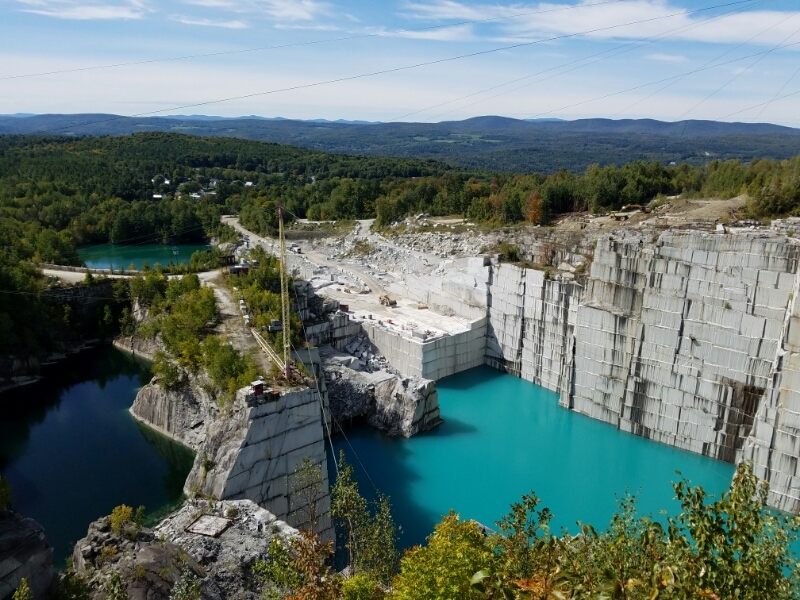 While at Shelburne museum last week, we picked up a flyer for a granite quarry tour. It is about 90 minutes away in the appropriately named town of Graniteville. Along our drive we saw this sign. Vermont has rednecks too, it seems. 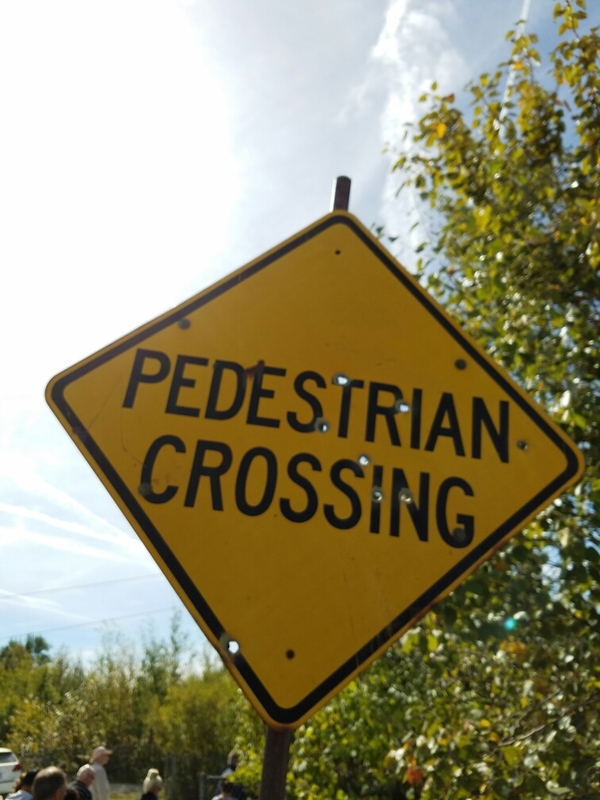 Growing up in Wyoming, we all thought it was sure nice of the highway department to put up metal targets in convenient locations all over the state so residents could keep their shooting skills fresh. In fact, they were even kind enough to make the targets reflective. Better for shooting at night! The urge to blast away at traffic signs is strong, but I would hate to be a pedestrian crossing here while target practice is underway. Still, except for that shot on the lower left, the clustering is fairly tight. Rock of ages has a massive factory just down the mountain from the actual quarry. We parked at the factory and then got the tour drive up to the quarry itself. The quarry itself is really amazing to see. The top of this mountain has been removed, exposing a pristine whitish grey granite of exceptional quality. The upper layers were blasted back so the poor quality stone, called “grout” could be removed. You can see it on the level just behind and above the red building in this photo. Incidentally that “grout” is piled around Graniteville in giant mounds a hundred feet or more tall. Massive blocks of granite, called “benches” are carved out of the granite mass. These benches are then cut into smaller pieces, each one weighing 150 TONS. The reason for the smaller cuts is so the granite can be lifted by the cranes out of the quarry. The granite here weighs about 180lbs per cubit foot. The marks left behind as benches were removed from the granite wall were clearly visible. Water below the main wall was brilliant turquoise blue color due to the presence of fine granite dust. That is the same phenomenon which gives glacial ice its famous blue color. 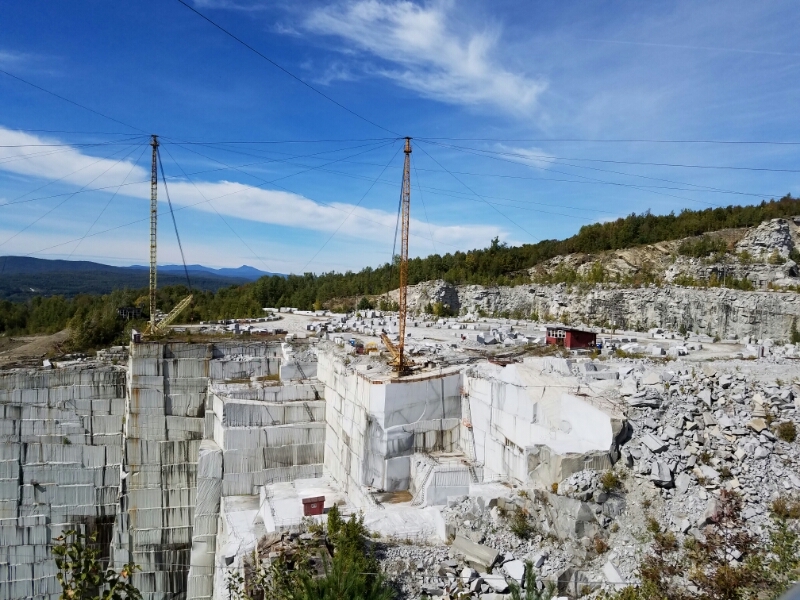 After being excavated from the quarry, granite makes its way down the mountain approximately one mile to the massive granite factory. The particular type of granite from Rock of Ages is exceptionally weather-resistant, and doesn’t stain or discolor like inferior stone. Because of this, Rock of Ages granite is used for many purposes but the most common is for cemetery headstone markers. 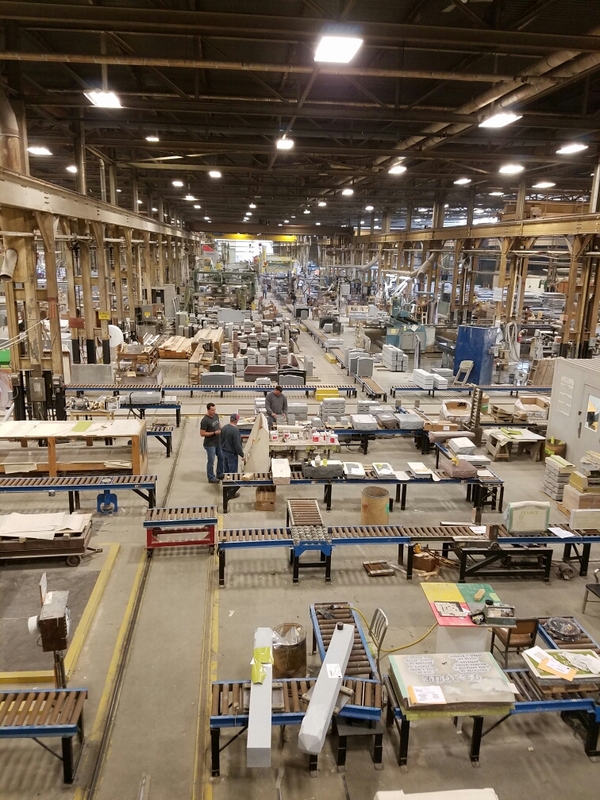 Here, artisans create the headstones based on customer orders. Each stone is custom and each stone is still worked largely by hand. 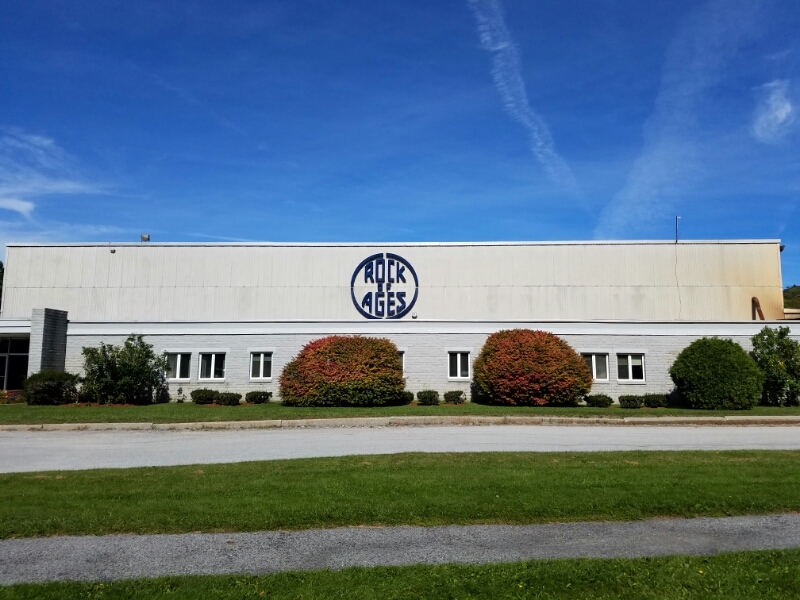 The vast majority of Rock of Ages customers are alive and have deliberately chosen Rock of Ages for the quality and longevity of the stones. 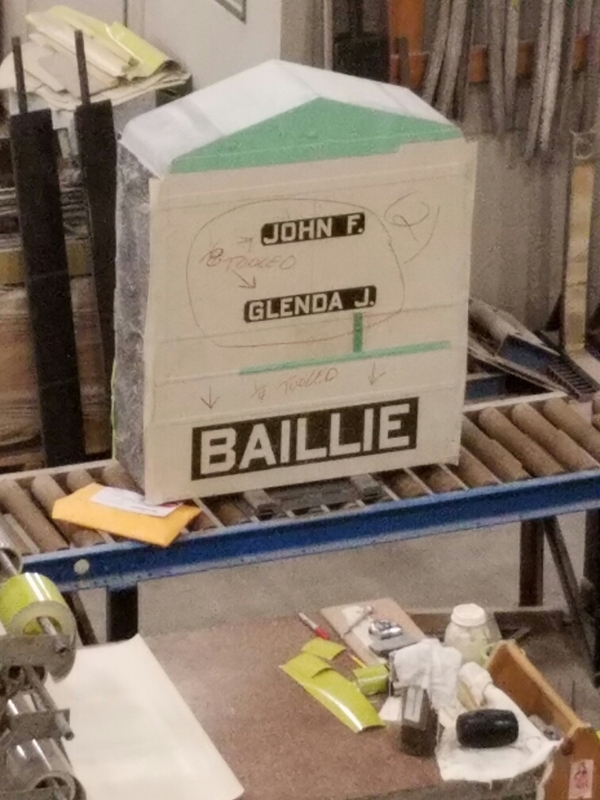 Once the headstones are complete, they are shipped to the customer. 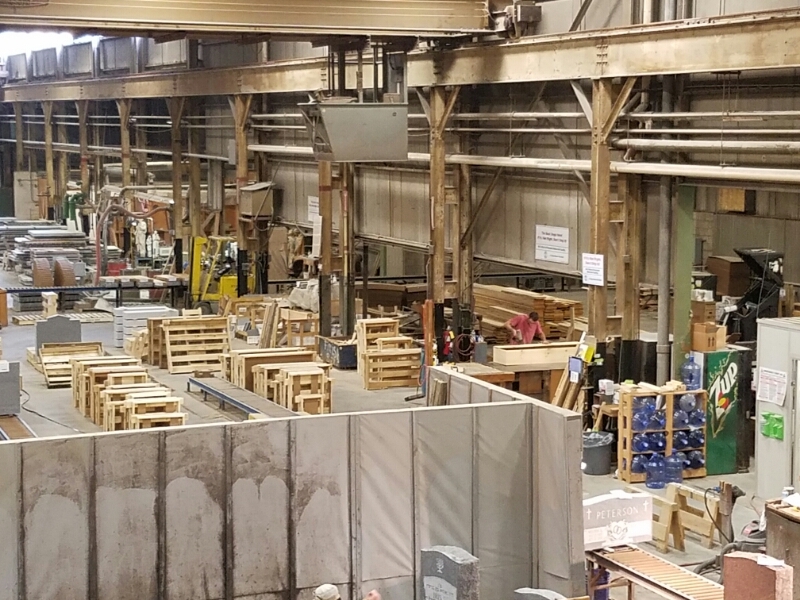 Rock of Ages has its own wood shop where custom wood shipping crates are manufactured to help move the granite without damaging it. 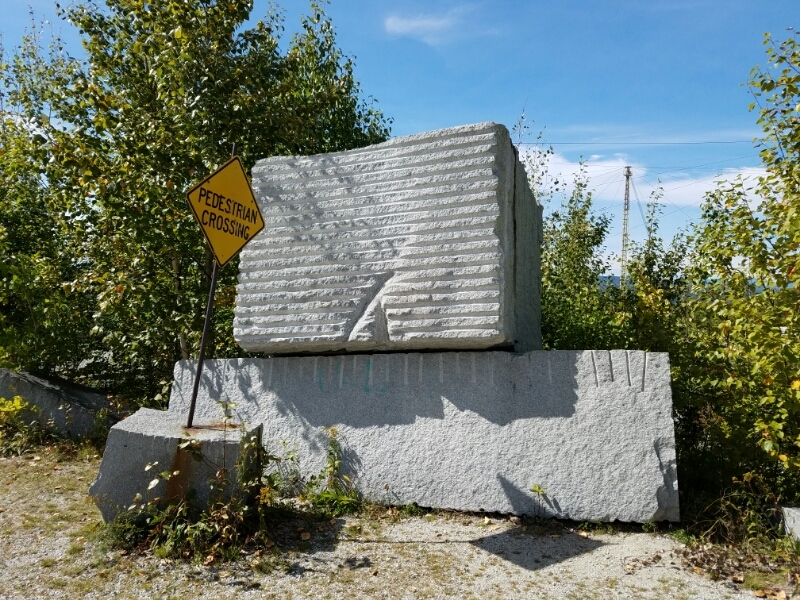 While most of the granite goes to headstones and cemetery monuments, other uses for the granite have been tried over the years. One such experiment was the use of granite for bowling alley lanes. A demo bowling lane was setup and is open for guests. I rolled a spare! The granite has barely weathered while the concrete gutters here have deteriorated – a testament to the quality of the granite. 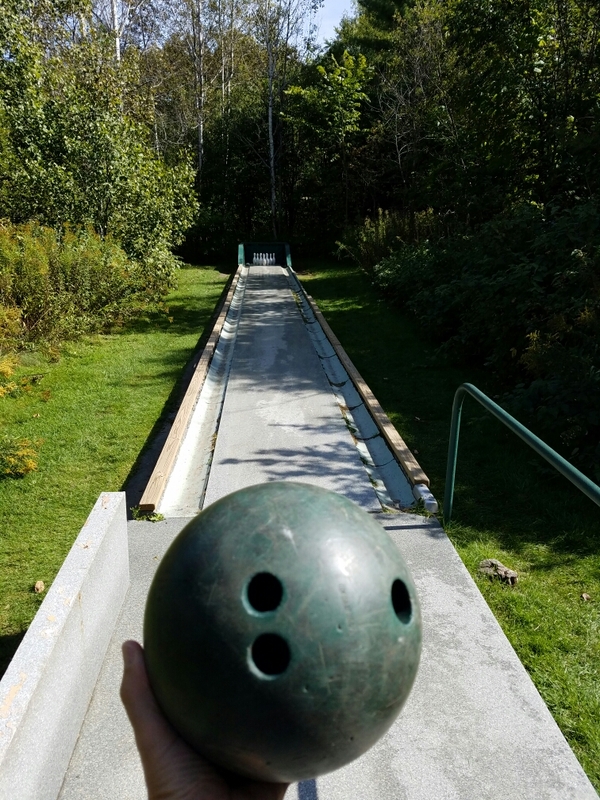 Granite bowling never took off, so outside of the quarry you won’t likely see a stone bowling lane anywhere else. Pure rock and roll. (gawd. That was BAD). Our campground has cool pedal cars. Skip Gilbert described them as a combination of John Deere, Formula One, the Flintstones, and Tour de France. That’s about right. We drove by them, proudly parked near the entrance, for two weeks. Every day, we said “we need to try those.” Well, finally that day had come. 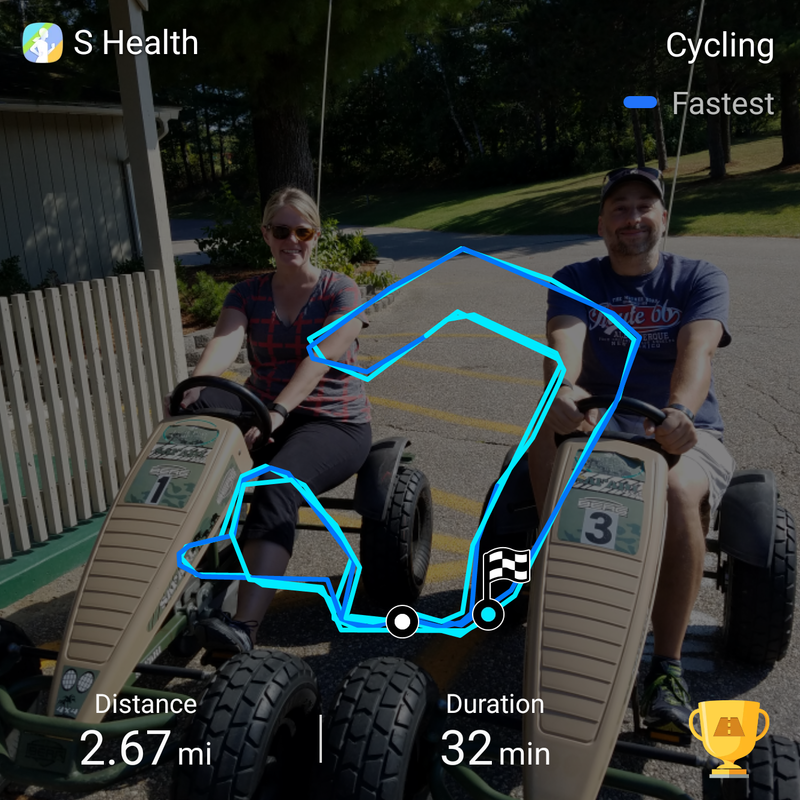 We had them for about 30 minutes, and that was enough time to pedal almost 2.7 miles! They are super fun, but more work than we expected. 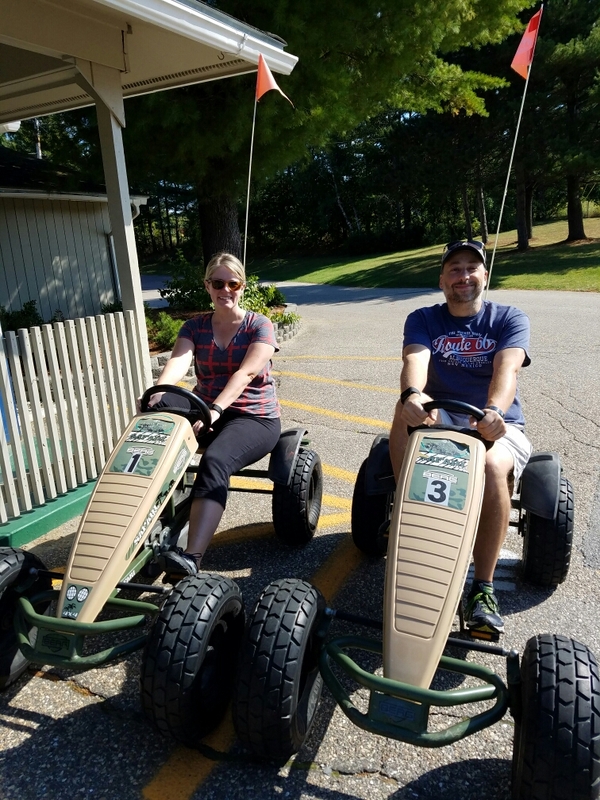 Not nearly worn out enough, we decided to head from the pedal carts to the hike around Colchester Pond. Pond. What a joke. Its easily a small lake. 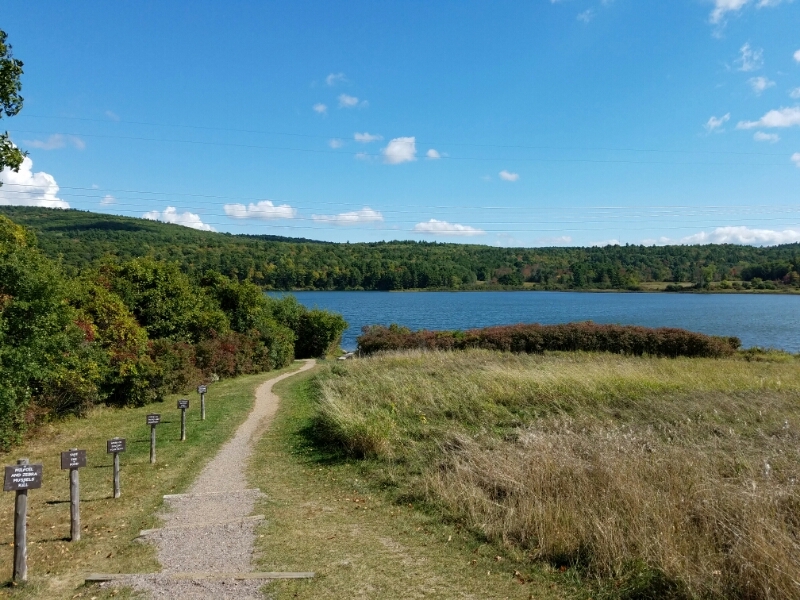 The walking path does a complete circle around the lake. The path starts in open land along the shore. The water is crystal clear. Sadly, as you can see, the trees still haven’t started to turn yet. 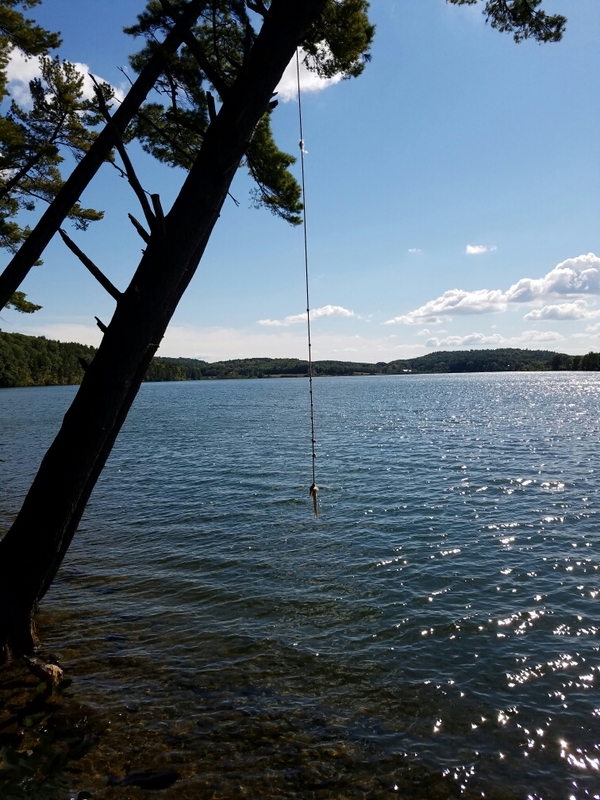 Locals clearly enjoy the lake; we came across this rope swing out over the water. It looked like a lot of fun but we didn’t try it. On the opposite side of the lake. . . er pond. 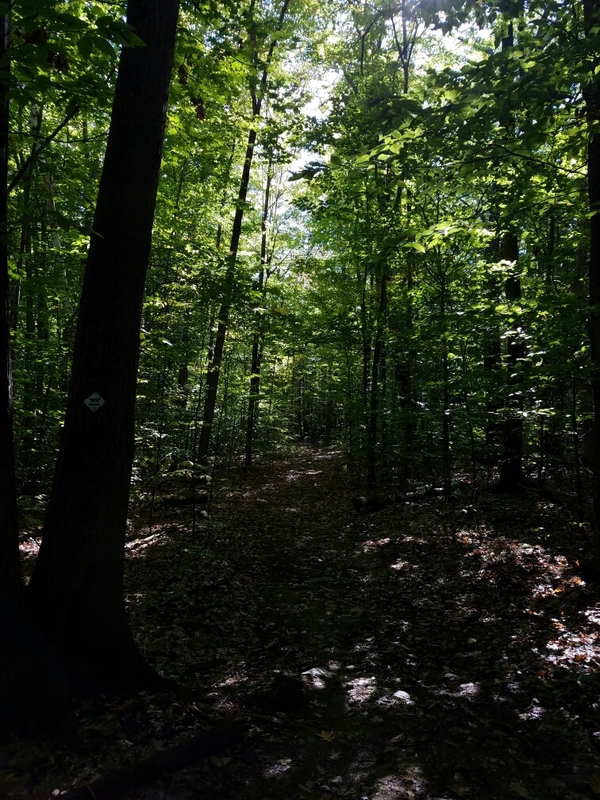 . . the trail entered the forest and we walked in shade. 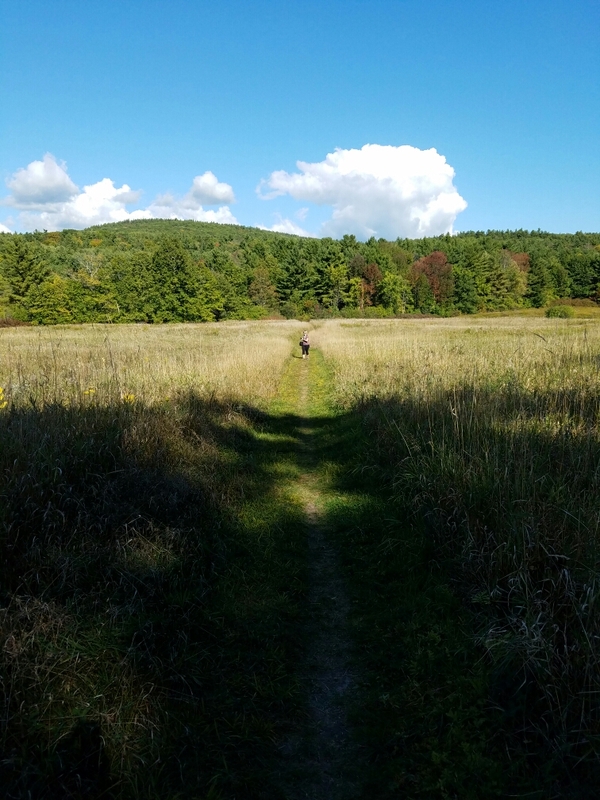 We exited the forest after about 2 miles of walking and emerged at the southern end of the pond. The fields here are enormous! Overall, according to our electronic gadgets, we walked almost 4 miles. 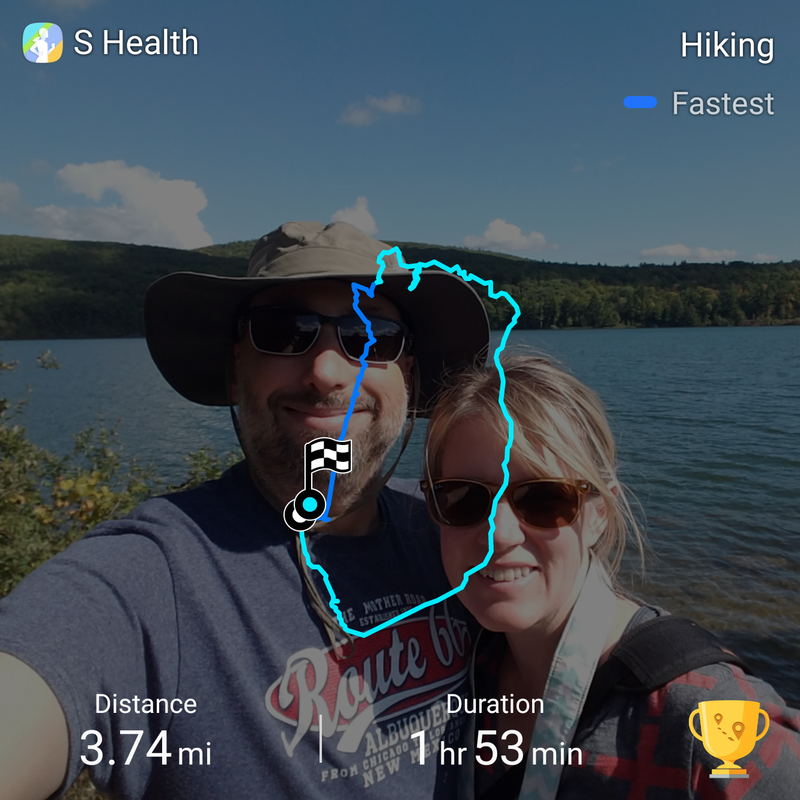 It was a great hike, with just enough challenging elevation changes to keep it interesting. I’d have to say this was one of the best hikes we’ve done on the entire trip. I have to say that after almost 3 weeks in Burlington and Vermont, we felt like we still hadn’t seen half of what is available. This area is definitely an incredible, special spot and we’re glad we saw it! Previous Previous post: Factory tours = perfect romantic date? Teddy bears, chocolate, and wine.